Comprised of disposable glass without ring mark. BRAND™ Blaubrand™ IntraEND™ Disposable Micropipets are in compliance with DIN ISO 7550 and CE-marked in accordance with IVD-Directive 98/79. Volume is defined by end-to-end filling. 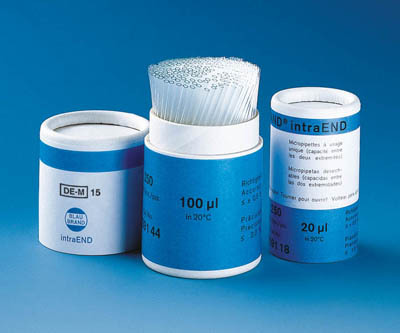 Volumes greater than 5μL include DE-M marking.